You are here: Home / Marketing / Will Sellers Believe Us Now? The market is speaking. When we say that print advertising is a means by which to satiate sellers and not an effective way to market a house, will sellers finally take note of the reality of the market? The LA Times’ shuttering/merging of its real estate section is a sign of the times, and one that Realtors and Sellers should recognize (I think that Buyers already know this). One wonders how long local real estate publications and sections have for this world. 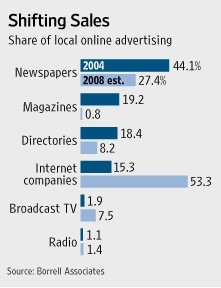 More at BHB and Seattle PI asks – Is Real Estate Newspaper Advertising on its Death Bed? Even more at the WSJ.